On Monday, November 27, 2017, the Ecumenical Patriarch Bartholomew of Constantinople, along with the Holy Synod of Bishops added to the calendar of saints, the Elder Iakovos Tsalikis who fell asleep in the Lord in 1991. His feastday has been set for November 22 (Gregorian Calendar) December 5 (Julian). The Holy Elder Iakovos (James) was born in 1920 in Asia Minor (present day Turkey) into a pious Greek Orthodox family. He grew up in a world in which the Orthodox people lived under the oppression of the Turkish government. When Iakovos was only two years old, his father was taken away by Turkish authorities and his mother Theodora and family forced to leave their native village never to return. The family emigrated to the Greek island of Evia where by the grace of God they were eventually reunited with Iakovos’ father Stavros. From a young age, Iakovos’ life was centered on his village church. It was said that by the time he was seven years old he knew the Divine Liturgy from memory. At the age of 13 he completed elementary school but due to the family’s poverty he was unable to continue his studies and joined his father at work. He lost his mother in 1942 and was drafted into the army in 1947. Upon his return from the army in 1949 his father died leaving him to care for his sister Anastasia until her marriage in 1952. The world is not in need of something to eat or something to drink – it is in need of our love. If we give it as much as we can, then we will blossom as monks in this life. 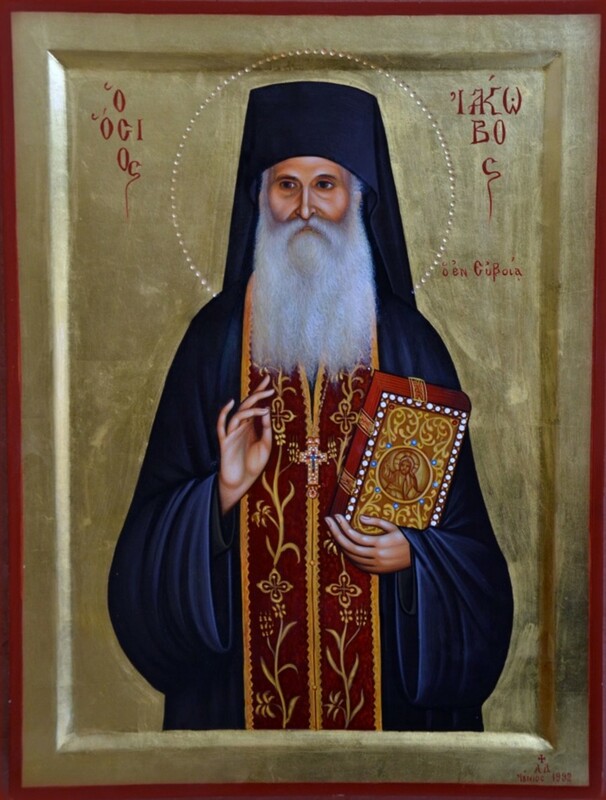 Beginning in 1990 his health began to decline and on November 21, 1991 he attended the Divine Liturgy, received Holy Communion, and heard the confessions of several people. He died peacefully later that day with thousands of people attending his funeral with many shouting “A saint! A saint!” The Monastery of St. David has recorded over 300 testimonies of miraculous help connected with the prayers of the Elder Iakovos. He was admitted to the hospital for the problems he was having with his heart. As soon as I heard that he was in the hospital, I went to see him. My first impression when I first saw him was something that cannot be described. If I told you that he was a man who was literally glowing is missing the point. His appearance was quite something else. He literally was filled with light. As soon as the Elder saw me, he made the following observation about me which literally made my hair stand on end. As a Christian I had never thought about this before. He said to me: “I do not know you. This is the first time that I meet you. But I can see your guardian angel standing behind you.” That which he said literally shook me up. I do not say this out of pride, and then he added: “All human beings have guardian angels and I now see your guardian angel. Be very careful that you never act in such a way that you chase away your guardian angel from your presence.” I get the chills every time I think of what he said to me when I met him for the first time. The Elder Iakovos finished his statement by saying: “That angel has been assigned to you from the day of your baptism. From the day of your baptism he accompanies you and he should never leave your side. It is he who will finally take your soul into his hands and will guide it until the Day of the Great Judgment. While guiding you to the Judgment the demons will attempt to bad mouth your acts in life. They will say to the angel ‘he did this evil deed and he did that sin. The guardian angel will defend your soul by responding that he also did this good act and that good deed. He is your lawyer and he will aggressively defend you. Therefore, be careful; do not ever distance yourself from him. I saw that he was close to you.” From that very moment I never forget that next to me I am being escorted in life by my personal guardian angel. This is a great message of joy to all those of us who have been baptized as Orthodox Christians. Blessed Augustine reminds us that we have been made to have a relationship with God, everything else is a cheap substitute that never fulfills, satisfies or brings peace. Just as a car is meant to run on gas, so our hearts and souls are designed for God. People involved in 12 Step programs like Alcoholics Anonymous or Narcotics Anonymous have learned this. They describe having a “hole in the soul” that they tried to fill with alcohol or drugs. In these 12-step programs they were taught and encouraged to find a relationship with God which is the key to their freedom from the addiction that was slowly destroying them. Elder Iakovos, like so many others today, went off to a monastery in order to wholeheartedly focus on this relationship with God which fulfills and brings peace. From his relationship with God he in turn became a source of help and healing to the people who came to him during his life and which continues now after his falling asleep in the Lord!